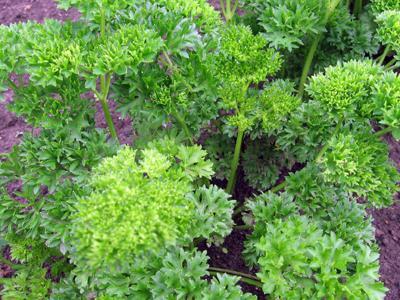 Usually grown as an annual herb, parsley, Petroselinum crispum, is actually biennial. In its first season, it forms a clump of leaves. The second year it produces flower stalks and a thick taproot. There are two common types, curly and flat-leaved or Italian. The curly type grows 8 to 12 inches and tall is best known as a garnish; it is favored in Britain. The flat-leaved variety has a stronger flavor and grow 2 to 3 feet. It is a staple of Italian cooking and increasing popular in American kitchens. Parsley is in the carrot family, Apiaceae, along with cilantro, dill and fennel. It is native to the Mediterranean region. Parsley is the host plant for larvae of some of the most brilliantly colored butterflies in North America, such as the Tiger swallowtail. If you spot yellow or green and black striped caterpillars on your plant, leave them be or carefully move them to another plant in the same family. You might even consider planting a row or two of parsley just for them in a butterfly garden. The scientific name comes from the Latin words for 'rock' and 'celery', because it has a similar flavor and habit to its relative celery and it grows wild on rocky slopes. This herb is best grown in cool weather in rich evenly moist soil that is high in organic matter. The plant likes full sun, but in hot climates plant it where it will receive some respite from afternoon sun. It can also be grown indoors on a sunny windowsill. Grow from seeds or transplants. Germination can be slow, so start seeds early indoors or under a cloche in the garden in mild climates. Soak seeds overnight and plant 6-8 weeks before you region's estimated last frost date. Transplant carefully because it is tap rooted. The bright green leaves and ferny texture are attractive in containers and borders as well as in the herb or vegetable garden. It looks nice along side other cool season plants such as violas, night-scented stocks and strawberries. The herb is good in soups, as a garnish, in salad or any vegetable dish, in pesto and to add contrasting color in tomato dishes. It is a main ingredient in the Italian flavoring gremmolata and the Middle Eastern dish tabouli. Parsley is very high in vitamins C and A, and also contains B1, B2 and iron. While the herb is widely used in cooking today and has been used for centuries, it wasn't eaten by people long ago. In ancient Greece it was considered sacred and medicinal and was worn as crowns and put on graves. Medicinally it has been used as a diuretic, carminative, appetite stimulant and digestive aid, as well as to freshen breath.